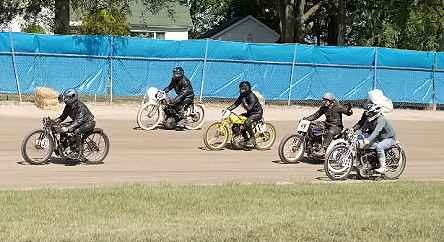 When the two Indian and six Harley flat trackers lined up for the Handshift Class Final Race at the Fulton Co. Fairgrounds, the crowd at the Antique Motorcycle Club Meet went wild! It had been decades since many had seen and heard the roar that these legendary handshift brands produce. Doug Horner, of Gates Mills, Ohio, on an Indian Sport Scout and Dennis Clark, of Kettering, Ohio, aboard a Harley WLR roared to the front of the pack and waged a six-lap battle just like the old days. Clark’s Harley seemed to have a horsepower advantage down the straights, but Horner’s Indian seemed to have better control in the corners and he was able to pass Clark for the win. But both riders thrilled the crowd, as did the entire racing program promoted by Scotty Brown, of the Bike Days Motorcycle Club www.bikedays.com and sponsored by Applied Innovations, Cycle Trader, Dixie International, Engraver’s Gallery, K-K Motorcycle Supply, Moose Racing, PJ’s Fabricating and Wiseco Piston. The program, similar to Davenport, Iowa antique flat track races, included very rarely seen board-trackers, Harley Hummers, brakeless machines, open vintage classes as well as the Ohio Long Track Speedway Championship. Patrick Murphy of Marcellus, NY led a rolling start of ten priceless board-trackers around the half mile dirt track, ahead of Evan Kunes aboard his immaculate Harley Davidson. The board-trackers were sponsored by the Wheels Through Time Museum. Mike Magee, of Conesville, Ohio was a double winner in the 165cc Harley Hummer class. Not only did he win the final, Rich Long, of Massillon, Ohio, riding Magee’s backup bike took second. The most prolific winner and probably the fastest rider of the day was Chad Rall, who won three finals: The Brakeless foot-shift final, the Speedway “B” final, and the Pro Twins final. While this was the 25th annual AMCA Meet at Wauseon, this was the first year that races have been held. Judging by the enthusiasm of the crowd, it will not be the last!